This article is about my preferred Tarot deck and reading method and the consecration ritual I constructed for it based on Egyptian hymns and Demotic spells to Tehuti (Thoth). In May of last year I was on holidays in a remote town in the Provence with my extended family for a few days. Before that my wife, daughter and I spent three days in the beautiful city of Marseille. Besides visiting the black madonna called Notre Dame de Confession in the ancient Abbaye St. Victor the other occult sightseeing spot I wanted to visit was the old Camoin House. 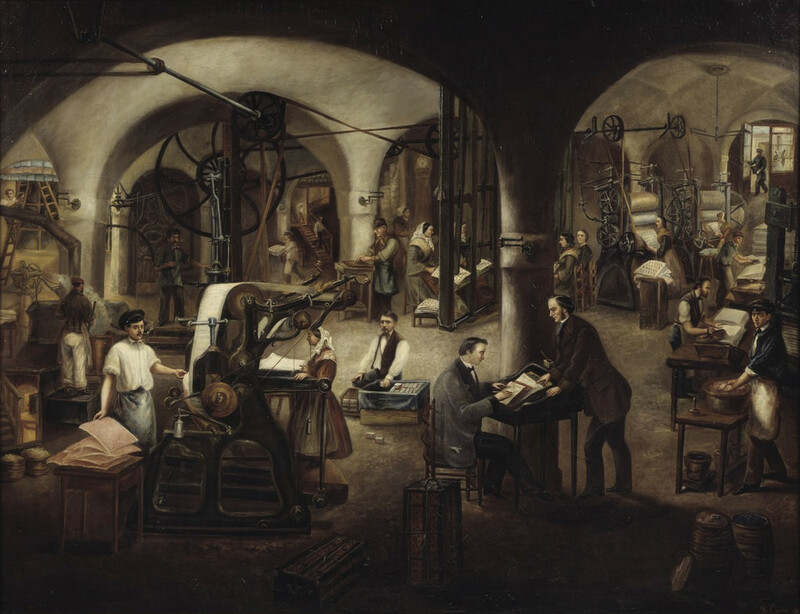 It is the building where in 1760 Nicolas Conver established his cardmaking factory and engraved his famous Tarot de Marseille, the mother of most modern Tarot decks. The winter before, I had been obsessing about the question which Tarot deck to use for divination. I had no experience with Tarot and after some research I had bought the beautiful Smith-Waite Centennial Tarot Deck which I really loved for aesthetic reasons and because Smith-Waite decks are apparently recommended for beginners. Unfortunately it did not really resonate so much with me after trying giving it a try for a few months. The detailed imagery of the minor arcana seemed sometimes a bit too detailed and confusing to me and results were too ambiguous. So I was looking for alternatives. I did not like any of the Smith-Waite derivatives and I also found Crowley's deck very unappealing. The final contestants were the Camoin Jodorowsky Tarot de Marseille deck, the Sola Busca from Scarlet Imprint, and the Hermetic Tarot and I could not really decide on one. My question was answered in an uncanny way on the day we walked through the lovely district of Noailles in Marseille, a lively area with a lot of North African expats. We strolled through the Rue d'Aubagne, a lively small street with a lot of cafés and small shops, mostly selling goods and delicacies from the Maghreb. We approached a small intersection and suddenly I was overwhelmed by a strange "epiphanic" feeling of clarity. It was as if the time stood still for a moment and everything went quiet, just to continue normally after a short glimpse. It was uplifting and strange at the same time. I checked the map to see where we were, because I knew that the old Camoin House was supposed to be in this very street. I discovered that we were standing right in front of it: Number 8! I was excited! Today it looks like a normal residential house and hosts a (delicious) Tunisian restaurant on the ground floor. Nothing points to the history of this building. I immediately knew that this strange moment was a clear hint which direction to take in my Tarot deck quest. 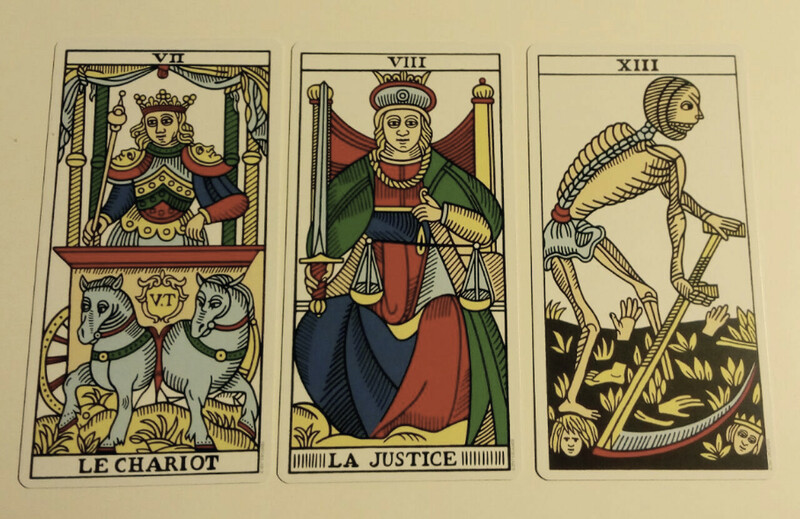 After I had jumped down the Tarot de Marseille rabbit-hole and read Jodorowsky's excellent book, I soon realized that Camoin and Jodo had altered the original Conver design and had added more little occult details into it. I did not like that approach and wanted something more genuine. The open reading is my way of reading the Tarot. In a nutshell, it is based on the three following points. 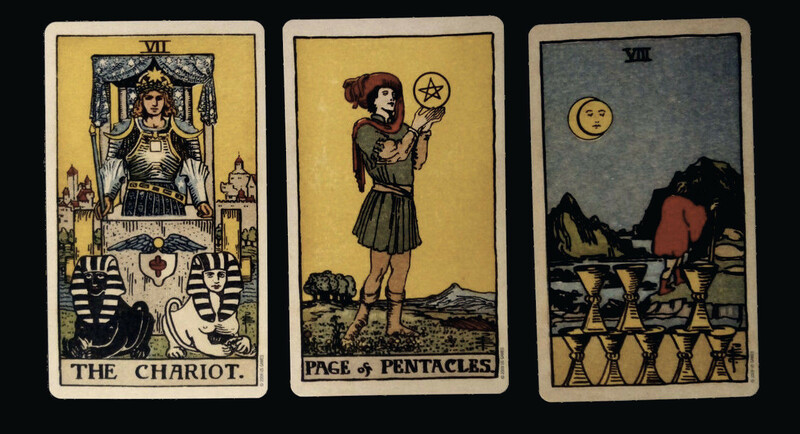 First, a Tarot card does not have a fixed meaning which can be learned in advance. Rather, the meaning emerges from what we can see in the card. Second, the function of each position in a spread is also not fixed. Rather, it depends on the card combination. Third, we don't start by interpreting each card separately. Instead, we first try to see the whole picture. This concept resonated very much with my idea of how divination is meant to work. 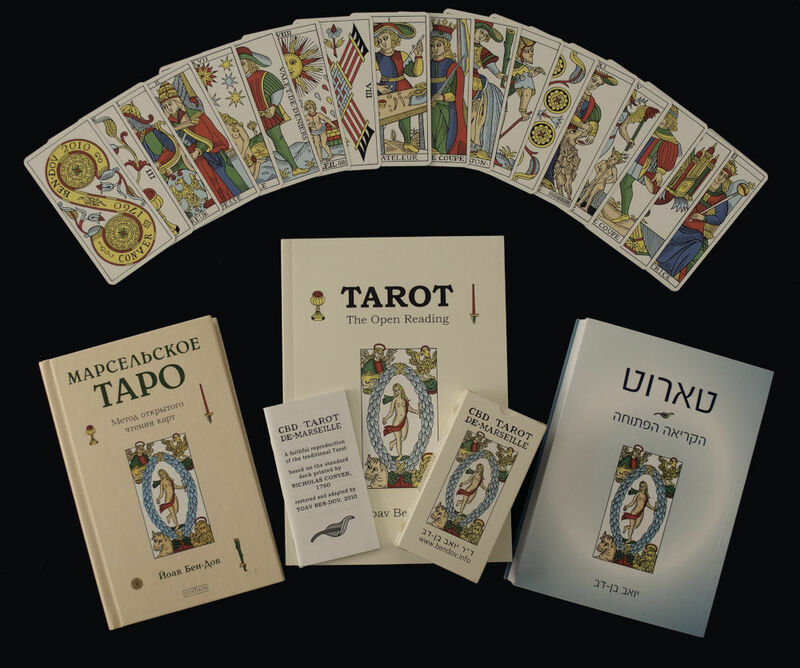 He had also created a very clear and clean reproduction of the original Conver Tarot deck that looked gorgeous and immediately became my top-pick. I bought Ben-Dov's ebook on Amazon, but had to wait a couple of months until the deck became available again after having been sold out. In the meantime I downloaded the free digital version and could already enjoy the design. Although the minor arcana cards can be a bit difficult to interpret, I resonated much more with the CBD Tarot de Marseille than with the Smith-Waite deck. Because my past attempts of reading the cards had been so ambiguous I decided that before using this new deck I would need to properly consecrate it, hoping to improve the clarity of the message. [Tehuti] facilitates the exchange across the border between the human and divine realms in his function as lord of sacred texts. [...] Re empowers [Tehuti] by a series of formulae linked to [Tehuti]'s diverse forms—the ibis, the moon, and the baboon. First, Re grants him the authority to send forth the other Gods through spells and invocations and to check their actions in turn, this power corresponding to the ibis. Next Re bids him to “encompass the two heavens with thy beauty and thy light,” this corresponding to the moon. Finally, Re charges him with traversing the lands of the Ha-nebu, the ‘Northern Lords', a vague term for the islands of the Aegean [...], perhaps implying a circuit around the Mediterranean and thus through many foreign lands—a hymn to [Tehuti] states that he “made different the tongue of one country from another,” (Bleeker 1973, 140); this last power corresponds to the baboon. Besides being the founder of the words of speech including magical words, he also was the demiurge who created the world through utterance. He has knowledge of true names of all creation, he has the power to heal and he's a god of justice. As a lunar god he presides over the passing of time and length of every human's life. He doesn't necessarily rule over, but at least has knowledge of all fate. Therefore he also presides over divination and prophecy. I thought it would be a great way to start a relationship with Tehuti by dedicating my new deck to him and consecrating it by his name in a proper ritual. The Greeks identified Tehuti with the divine messenger and trickster god Hermes, ruler over trade, heraldry, merchants, commerce, roads, sports, and travel. The god of boundaries and the transgression of boundaries, patron of herdsmen, thieves, graves, and heralds. 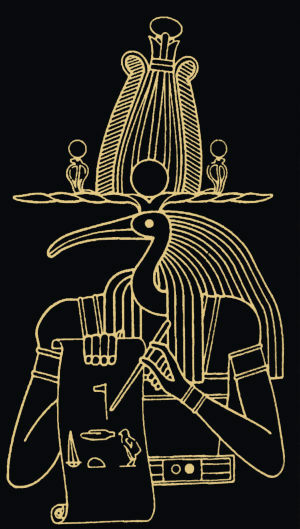 Like Tehuti Hermes is described as moving freely between the worlds of the mortal and divine, and was the conductor of souls into the afterlife. Hermes is also the son of Zeus and Zeus is the only god who knows the affairs of men, all that the Moirai (Fates) give them, and all that is not destined for them. Zeus is also the only god not affected by the decisions of the Moirai, but obeyed by them. So a suitable planetary timing for the consecration would be the hour of Mercury on a Wednesday or Thursday. I was especially paranoid about negative spiritual residue on the cards due the production process they went through. So my choice of day was Saturday because I've had some good experiences working with Kronos/Saturn to wipe and purify items. Also it seems very fitting to Tehuti that the hour of Mercury is followed by the hour of Luna, I imagine him dwelling right on the edge of the two. I timed the consecration in a way so it would start at the end of Mercury's hour and be done in the beginning of Luna's. I start all of my rituals with the acknowledgement of the planetary rulers by reciting a planetary prayer from the Hygromanteia and the matching Orphic Hymn. When the rite is heavily Egyptian, like this one, I put more weight to that paradigm by acknowledging the ruling Decan. Planetary prayer of the day. Orphic hymn to the planet of the day. Planetary prayer of the hour. Orphic hymn to the planet of the hour. You can find different versions of the Orphic Hymns. The very recent translation by Patrick Dunn flow very well in English. Or use the free ones you can find here. The Egyptians venerated and feared the baktiu (Decans), gods ruling over time and fate, signified by stars near the ecliptic that were observed to measure slices of time and to determine which decan ruled over them. I will get deeper into this topic in a series of future posts. For now, let's acknowledge them in this working with this hymn to the Decans found at the temple of Esna, combined with an Egyptian offering formula. To find the appropriate name of the current Decan, find out the sidereal Zodiac degree you are currently in and use the table below. You are the god who slaughters him. Of prophecy, by your own wond'rous deeds. (1) Inscription from the temple of Esna translated by me into English from the German translation I found in Alexandra von Lieven's "Der Himmel über Esna: eine Fallstudie zur religiösen Astronomie in Ägypten am Beispiel der kosmologischen Decken-und Architravinschriften im Tempel von Esna" in Vol. 64. Otto Harrassowitz Verlag, 2000. Page 43. (3) Common Egyptian offering formula. It translates to: "A voice offering of bread, beer, a thousand of beef and fowl, and every good and pure thing on which a god lives"
(4) Adoration of Thoth, inscribed on a statue of Haremhab, a royal scribe and general of the army under Tutankhamun. (5) from PGM V. 370-446 in Betz, Hans Dieter, ed. The Greek magical papyri in translation, including the Demotic spells. Vol. 1. University of Chicago Press, 1996. pg. 108. (6) translation from demotic spells with secret names of Tehuti from Louvre E 3229 papyrus (Betz PDM lxi. 63-78 and PDM Suppl. 149—62) found in (5) pg. 288 and 328. I call to you, O Tehuti, In your names which are great, which are divine, ALIPS, THABLIPS, STSILIPS, GAGARPAOTHAR, THANASIMA, QHAH, ORTHOMENKHROÔN, BALSA, ALABAKHABEL, HEFKAE, HEPKA, HEBIKE, NEKHEPKAI, Show me the truth by these cards. "Using one card, answer my following question..."
"Using two cards, representing the two choices I have concerning ... tell me what to expect"
"Using three cards, representing from left to right: the past, the present, and the future, answer me concerning..."
After, I shuffle a bit more until I have the feeling that I need to stop and lay the agreed number of cards down in front of me. I interpret them intuitively using Ben-Dov's Open Reading method. In addition I check the common interpretations found in the usually frowned upon little white book that comes with the deck and treat it like a "second layer" on top of my initial intuitive interpretation to see the bigger picture. After the ambiguous experiences I had had before, using the Smith-Waite deck, consulting this Tehuti consecrated CBD Tarot feels like a crystal-clear, Dolby Surround, Full-HD, video-conference uplink directly to the Ibis-headed god. So far I've always had mind-blowing readings with very straight-forward answers. But I have to admit that I only read for myself and not for others. I will still have to try that out. After initial doubts I know fully trust my Tarot and almost treat it like an intimate companion. It travels with me most of the time. Sounds cheesy? Yeah it does! I didn't expect such a strong link to happen at all, it just did. Tehuti rules over prophecy in general, so you can use the above ritual also to consecrate other divination tools. I am looking forward to apply an adapted version of the ritual to a set of four Japanese 100¥ coins I recently found and use them in the way Sam Block laid out his Four Coin Divination of Hermes.